Some of the most eye-popping public art going up in Coeur d’Alene can be found at busy intersections. Original paintings and photos digitally transferred to vinyl are dressing up drab signal boxes from downtown and Riverstone to Ramsey Road and Government Way. 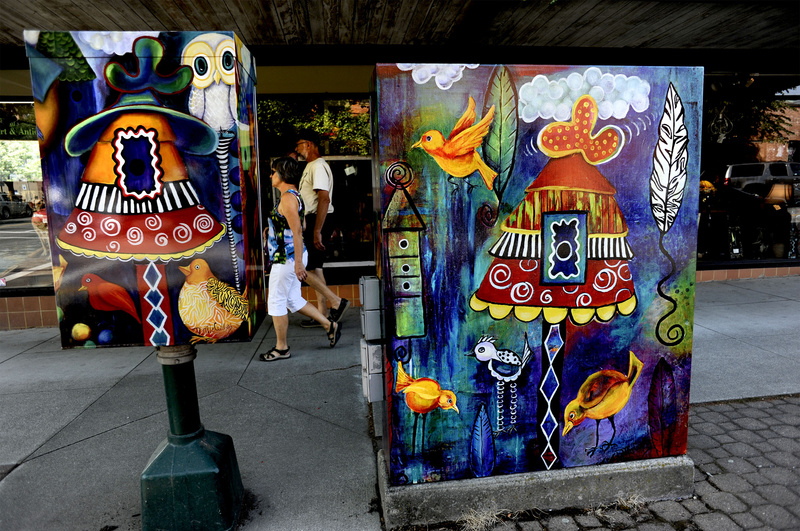 Inspired by a similar project in Boise, the city and the Coeur d’Alene Arts Commission launched the beautification program last year with art wraps on six of the street-level metal boxes, which house traffic signal equipment. They’re on track to decorate another 13 boxes this year and plan to continue next year. The wraps add to the city’s public art inventory while also deterring graffiti. Blank canvases are a target of taggers, but defacement stops once the vibrant wraps go on, said Steve Anthony, Coeur d’Alene’s recreation director. Each wrap is commissioned for $600 and should last at least eight years, he said. One of the artists whose paintings were chosen for three downtown boxes is Debbie McCulley, a hair stylist from Spokane Valley. Her fanciful depictions of fish, birds and bird houses can be found at the intersections of Fifth Street and Sherman Avenue and Seventh Street and Lakeside Avenue. “I felt like it was ideal for downtown Coeur d’Alene – the colors and the whimsy and the theme,” said McCulley, a juried show artist at Art on the Green this weekend. Some of the wraps pay tribute to the area’s environment and history with depictions of salmon and moose, tugboats and fly fishing. The city also collaborated with local students on the project. Ramsey and Sorenson elementary schools, Woodland and Lakes middle schools and Lake City and Coeur d’Alene high schools each took on one signal box.